Bruce Bairnsfather's cartoons during the First World War were a major plank in the morale of the troops on the Front Line and of those at Home. His drawings, based upon personal experience in the trenches, showed life as it really was, yet at the same time allowed everyone to laugh - at themselves, at authority and at the enemy. His cartoons were avidly anticipated in the trenches and in most homes in Great Britain (who would also have owned examples of the many pottery items that carried his drawings). The French, Italian and American Forces, recognising the effect of Bairnsfather’s cartoons upon morale, asked for Bairnsfather to work his special magic on their troops too. Soon plays and films featuring his archetypal characters, Old Bill, Bert and Alf were making people laugh literally all over the world and he was uniquely created 'Officer Cartoonist'. The Secret Service (MI7) planned the inclusion of propaganda messages in the replies to his fan mail. However, The Establishment, and armchair Generals were upset by the realistic depiction of life in the trenches and The Times decried the drawings as showing a 'degraded type of face'. Later the Imperial War Museum dismissed the 'artistic' value of the drawings - as if that mattered or was even true. In our opinion these ignorant attitudes have prevented Bruce Bairnsfather's contribution to the war effort from being properly and officially recognised. In 1934 the British Legion Journal said, 'England owes Bruce Bairnsfather a good deal more than its leaders have yet recognised'. It is time for that recognition. 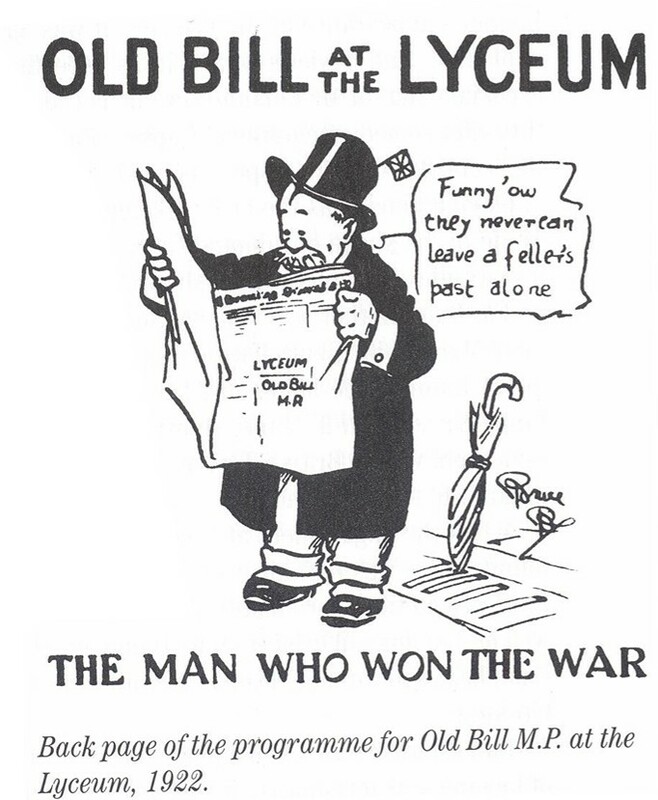 We are proposing that a leading member of the Government should make a statement in the House that Bairnsfather's contribution should be retrospectively recognised and that that statement should be made just before the 100th Anniverary of the publication of Bairnsfather's most famous cartoon - 'The Better 'Ole' - in October 2015. The power of just that one cartoon alone is such that it is continually used even today with characters as diverse as Archbishops, Prime Ministers, Russian leaders, Bosnian personalities and Sinn-Fein IRA finding themselves in that ‘Ole. No donations of any sort are asked for. Your support will help us to redress a wrong for the man who Sir Ian Hamilton said was, 'a real asset …who made the Empire laugh in its darkest hour’.